Kristen Simonsen of Southport finishes as the first place female runner with a time of 40:52 during a 5.85 road race at Compo Beach in Westport on Saturday, August 7, 2010. The Westport Parks and Recreation Department will open the 2011 and 49th annual Summer Road Runners season Saturday, July 2 at 8 a.m. with the traditional 2.3-mile race starting and finishing at Staples High School. 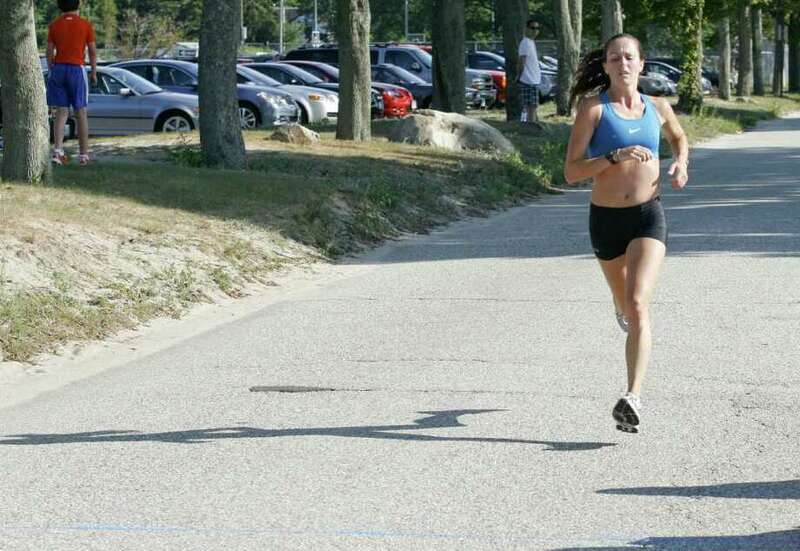 The program is a series of races held on Saturday mornings, which progressively increase in distance throughout the summer and concludes with the Annual Westport Labor Day Weekend 10-mile race. This year, the format will be the same as last year. First, an entry fee of $30 for Westport residents and $50 for non-residents will be charged for the entire series of races, including the Labor Day Weekend race. Additionally, runners have the option of choosing to pay a weekly fee of $5 or $8 per race for residents and non-residents respectively instead of the series program fee. Second, the weekly series of Saturday morning races will be scored grand prix fashion in seven age divisions for both men and women. The Junior Division will be for runners age 19 and younger, the Open Division for runners ages 20--29, the Sub-Masters Division for runners ages 30--39, the Masters Division for runners ages 40--49, the Grand Masters Division for runners ages 50--59, the Veterans Division for runners ages 60-69, and the Grand Veterans Division for runners ages 70 and older. Points will be scored each week in each division for the first three places with the winners being announced on Saturday of Labor Day Weekend. Third, the first three men and women overall finishers in each weekly race will be awarded T-shirts. In addition, each runner who finishes each race will be eligible for the weekly prize lottery. Fourth, all participants younger than 18 years of age are required to have a parent or guardian's permission secured by a signed application form. Finally, co-sponsors for this year's series of races will again include The Pequot Runners, Running Times Magazine, Village Bagels, Road ID, Sherpa, Runners Roost and Matthew Greene of Northwestern Mutual in Westport. Additional per race sponsorship will also be announced during the summer as they occur. Saturday's race will start on the Staples track. The runners will run 300 meters on the track and then follow the service path up the hill and behind Bedford Middle School to the Wakeman Park playing fields, they will cross the fields diagonally and connect with the Wakeman Park entrance road, turn left on Cross Highway, left on North Avenue, left on the Bedford Entrance Road, left to the service path at the Wakeman Park playing fields, right behind Bedford, down the hill to the Staples track and finish on the track in the opposite direction of the start. Westporter Roy Mascolino set the record for the 2.3-mile race (10:25) in 1986. Participants are reminded to park in the Staples north parking lot and walk down the hill or down the stairs by the bleachers to the Staples track which is located behind the fieldhouse. All interested persons are invited to participate. Applications for and information about the program are available at the Westport Parks and Recreation Office, at the start of each Saturday's run or on the Westport Road Runners Summer Series web site located at: westportroadrunners.org. Registration for each run begins at 7:30 a.m. each Saturday. Staples cross country and track coach Laddie Lawrence has been active in the program since its inception, and will be directing it for the 46th season. Current and alumni Staples track athletes will assist Lawrence.